President Trump suggested Tuesday that he'd like to leave the Middle East entirely but Israel is "one reason" for remaining. In addition to preserving cheap oil, Trump said, the Saudis are essential to maintaining stability in the Middle East. "It's a dangerous, rough part of the world," he said. "But they've been a great ally. Without them, Israel would be in a lot more trouble. We need to have a counterbalance to Iran." The president said that he had never done business with the Saudis and that his future financial interests had no bearing on his policy decisions. "Never did business with them, never intend to do business with them," Trump said. "I couldn't care less. This is a very important job that I'm doing right now. The last thing I care about is doing business with people. I only do business for us." In the past, Trump has said he did business with Saudis, including selling them real estate. But the president also seemed to envision a day when the United States wasn't so beholden to the Saudis. "It's very important to have Saudi Arabia as an ally, if we're going to stay in that part of the world," Trump said. "Now, are we going to stay in that part of the world? One reason to is Israel. Oil is becoming less and less of a reason because we're producing more oil now than we've ever produced. So, you know, all of a sudden it gets to a point where you don't have to stay there." The President of the United States has now openly admitted the interests of Israel is what drives our foreign policy in the Middle East. 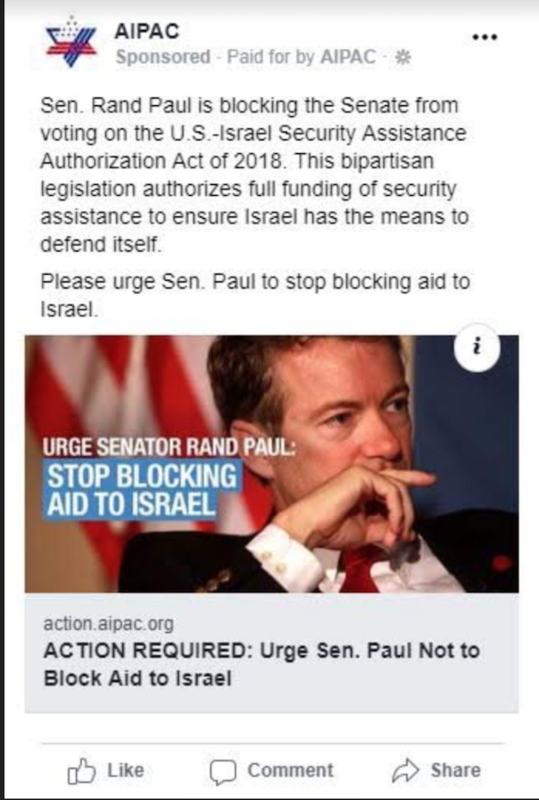 As this is all happening, Rand Paul is currently being dragged through the mud for putting a hold on a record $38 billion military aid package to Israel negotiated under Obama and signed off on overwhelmingly by Democrats and Republicans in the House and Senate (who can't agree on anything to help America). This is getting zero coverage America's controlled press. I'm not for foreign aid in general, if we are going to send aid to Israel it should be limited in time and scope so we aren't doing it forever, and it should be paid for by cutting the aid to people who hate Israel and America. This is a stance I've taken for many years. Why are we giving twice as much money to nations that surround Israel, which forces Israel to spend more on defense? We have given billions to Pakistan and the the Palestinian Authority. I've repeatedly introduced legislation to stop this, only to be opposed by AIPAC and others. Why are we giving one penny to people who hate America? This is Washington's dirty little secret: The US gives Foreign Aid to enemies of Israel. Each time I've tried to stop giving aid to enemies of the US and Israel, I have been thwarted. Often by groups that claim they are pro-Israel. Why would supposedly pro-Israel groups oppose my legislation to end aid to the Palestinian Liberation Organization? Maybe it's because they fear any debate on anyone's foreign aid threatens a broader debate on whether we should be borrowing from foreign countries simply to send the money to other foreign countries. 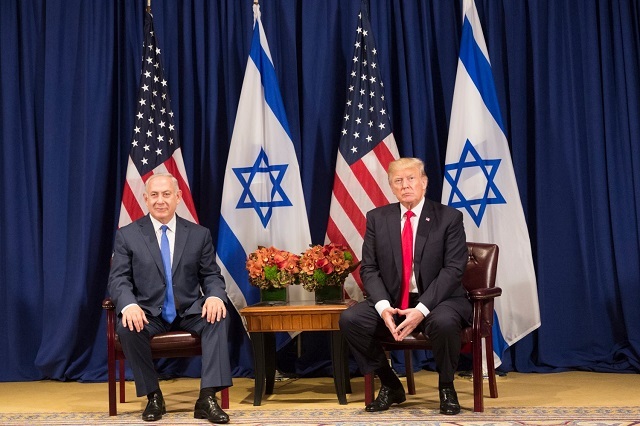 I still agree with Israel's leader [Benjamin] Netanyahu, who said, "But I believe there can be no greater tribute to America's long-standing economic aid to Israel than for us to be able to say: We are going to achieve economic independence. We are going to do it. In the next four years, we will begin the long-term process of gradually reducing the level of your generous economic assistance to Israel. I am convinced that our economic policies will lay the foundation for total self-reliance and great economic strength." I also agree with Conservative leader Naftali Bennett, who has said, "Today, U.S. military aid is roughly one percent of Israel's economy� our situation today is very different from what it was 20 and 30 years ago. Israel is much stronger, much wealthier, and we need to be independent."